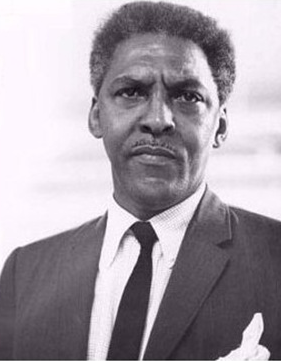 1912-1987 Known as the “Architect of the March on Washington,” Bayard Rustin was a tireless crusader for civil rights in the nonviolent tradition of Mohandas Gandhi. Rustin initiated the Freedom Ride movement by leading 1947’s Journey of Reconciliation, and played an instrumental role in the organization of 1963’s Great March on Washington for Jobs and Freedom. After the great legislative civil rights victories of the mid-1960s, he began to focus specifically on the financial problems of unemployed African Americans and working- class Americans in general. His later work with the A. Philip Randolph Institute tackled both racial and economic injustices, and he fought tirelessly for the civil rights of members of the gay community. Shortly after relocating to New York City in 1937, Rustin began working for the Fellowship of Reconciliation (FOR), an interfaith religious group that continues to fight for social justice using tenets of nonviolent action and passive resistance. While serving as youth secretary at FOR. he helped fellow civil rights activists George Houser, Bernice Fisher, and James L. Farmer, Jr., as they were forming the Congress of Racial Equality (CORE). Although he isn’t recognized as an official founder of CORE. Rustin was instrumental in establishing the organization’s fundamental nonviolent principles. In 1947, Rustin and fellow FOR staff member George Houser organized the historic Journey of Reconciliation, a protest against segregated public transportation that predated the famous Freedom Rides of the 1960s by well over a decade. For a period of two weeks, Rustin and 13 other black and white protesters rode interstate busses throughout the southern United States, refusing to take their places within the established segregated seating system. As a consequence of this radical act, Rustin was arrested and sentenced to hard labor on a prison chain gang. Rustin’s association with Dr. Martin Luther King, Jr., began in 1956 when he was recruited to provide key advice in the field of nonviolent Gandhian tactics. The very next year, he helped Dr. King establish the powerful and influential Southern Christian Leadership Conference (SCLC).